I bet these would be an incredible way to teach history – probably not to an elementary set as the stories would be a too complex, but to middle schoolers and high schoolers these would be perfect. Even college courses could use them! The visual dimension would do so much toward allowing history to come alive. I also wonder – as when I was reading Alexander Hamilton’s words to Congress in the above panel – if he ever uses actual writings from the time period to supplement his text. You know? It wouldn’t be too hard to look up an actual address Hamilton gave to Congress and weave that in around the writing he’s doing on his own. The Hamilton speech certainly had an authentic ring to it, either way. As someone who’s always loved history (and who has a degree to teach it, even though I (happily) teach theology), I’m fascinated by these. There applications for both entertainment and education are so diverse! I get excited whenever I see a new post you’ve done on something by Brian Wood :). Hamilton did write about the need for a Navy in one of his essays for the Federalist Papers (No. 11) in 1787, so I assume the words in this book are based off his writings or speeches. I do believe that these Rebels books would be excellent supplemental readings to classroom teachings! 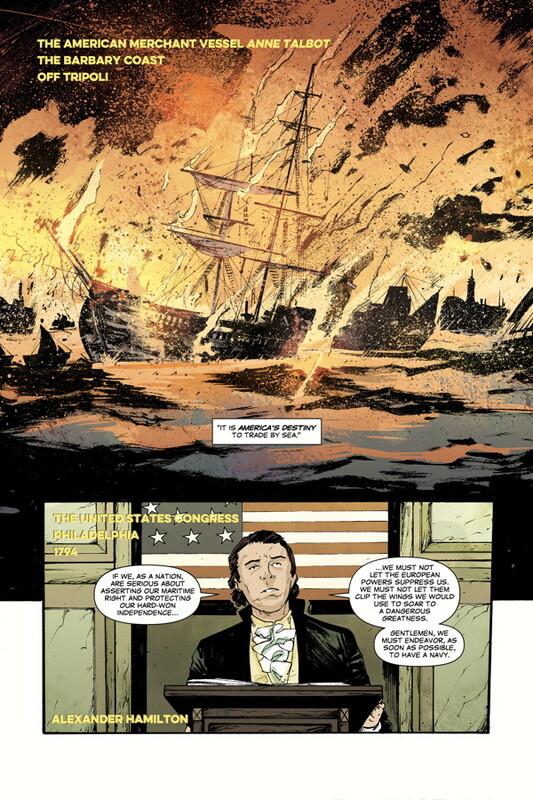 That makes these comics even more exciting – if they are drawing from historical documents to shape their text. I love it!